Please refer to our stock # TG20010 when inquiring. This is a vintage JOSEFF 1930s Necklace and Earring set. 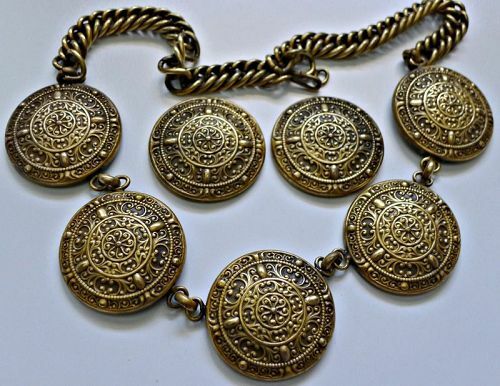 This large and gorgeous set is made of the Russian gold toned metal that is caracteristic of Joseff pieces. The set is made up of molded or sculptured discs. The necklace is 18 inches long and each of the five discs measure about 1 1/2 inches in diameter. It has a heavy chain with a fish hook closure. It is signed Joseff on the back of the center disc. The earrings are clips and each 1 1/2 inch in diameter. Only one earring is signed. The set is a real treasure from "The Jeweler to the Stars" and is in excellent condition.